Social critic Fank Gashumba at CMI headquarters in Mbuya recently. File photo. KAMPALA–The trial of the fraud case against social commentator Frank Gashumba and two others has failed to kick off due to an extra-ordinary meeting of all judicial officers in Uganda at the High court in Kampala. This was revealed to court by Senior Principal Magistrate Charles Yeteise as he was adjourning the case on behalf of the trial Chief Magistrate James Eremye Mawanda. Gashumba and his brother Innocent Kasumba are facing charges of impersonation, forgery and being in possession of narcotics. 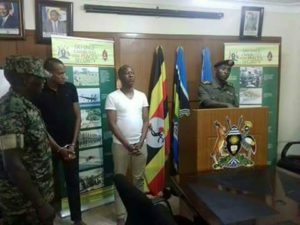 They are also jointly charged with a Tour and travel guide officer from MJ Safaris company Ismail Kiyingi. The two brothers are said to have conspired with Kiyinji to falsely represent themselves as officials from the Ministry of Defence and Veteran Affairs in order to obtain money from two Dutch nationals under the guise of offering them contracts to supply trucks, troop carriers, water tanks, and heavy machines among other items to Ministry of Defence. They also face charges of being in possession of suspected marijuana, which is illegal in Uganda. Furthermore, Gashumba and Kasumba are accused of forging Identification cards of Ministry of Defence officials in the names of Col. Francis Okello, the Director Logistics and Dr John Mwine, the Director Procurement respectively; which forged IDs they allegedly showed to the two Dutch nationals. Apart from the forgery of IDs, the brothers are also charged with the forgery of several stamps of the Republic of South Sudanese ministries including, Agriculture, health, Education, Finance and Transport.